By David Ponce on 10/02/15 • Leave a comment! Many people start their days with peanut butter and jelly sandwiches. Ok, mostly kids, sure, but some grown up kids as well. 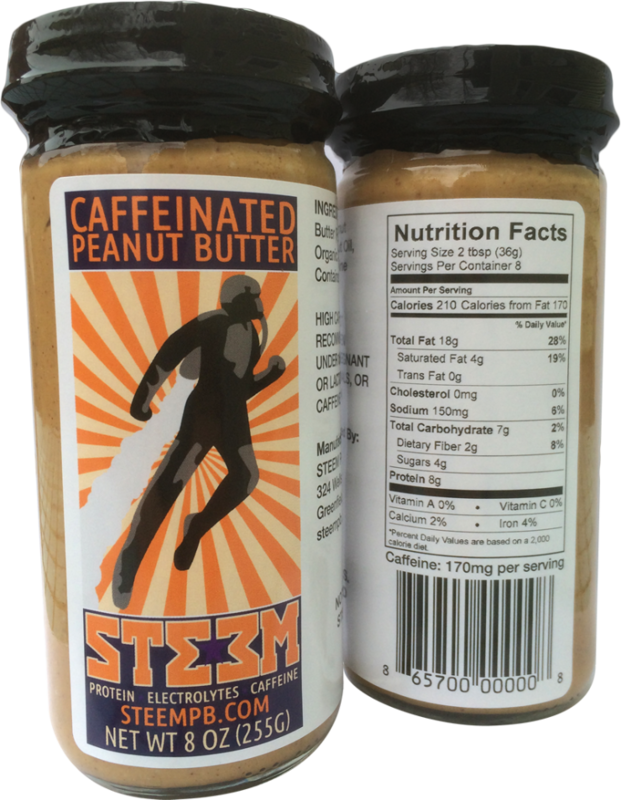 These people might be interested in the Caffeinated Peanut Butter by a Massachusetts-based company called Steem. Each 2-tablespoon serving of the product contains as much pick-me-up as a regular cup of coffee, and the entire mix is made from all-natural ingredients: green-coffee extract, salt, peanuts, peanut oil and agave nectar for a little extra sweetness. It’s available from a variety of retailers around the Boston area, or online, for $5 a jar. By Hazel Chua on 06/19/14 • Leave a comment! Need a dose of caffeine without the bitterness? Most energy drinks have an aftertaste that makes some people nauseous, and if you’re not a fan of coffee, then you’re left with few alternatives. What you need at this point is CaffeinAll. It’s basically powdered caffeine that you can sprinkle all over your food and into soups and drinks so you can get that extra kick while you’re in the middle of a particularly long and tiring day. CaffeinAll is being marketed as an affordable alternative to typical sources of caffeine. Plus the fact that you can sprinkle it to almost anything means that you can “create” your very own energy food, anytime, anywhere. Each sprinkle contains about 100mg of caffeine, although three shakes is the recommended maximum daily intake so you don’t become an over-caffeinated mess. CaffeinAll is up for funding on Indiegogo, where a pledge of $15 will get you a bottle that can give you up to 200 shakes. By Hazel Chua on 03/21/14 • Leave a comment! Breaking up is hard to do, but losing weight is even harder. At least, it is, for the people who have tried but constantly failed. It’s probably this group of people that the makers of this Caffeine-Infused Slimming Tank Top are targeting. As the name implies, this top apparently has slimming properties as it’s infused with green coffee and brown algae that’ll work on stimulating your body’s metabolism. That’s because the micronized caffeine stimulates lipolysis, which is the natural breakdown of stored fats, while the brown algae moisturizes the skin. It also cheats because the top comes in black, and we all know black gives the illusion of a slimmer figure. The manufacturer claims that the top can help trim its wearer’s hips by up to 1 inch and thighs by up to 11/4 of an inch if it’s worth for eight hours a day for 21 straight days. Sounds too good to be true, I’ll give it that, but who knows? It could actually work. The Caffeine-Infused Slimming Top retails for $85. Not a fan of coffee? 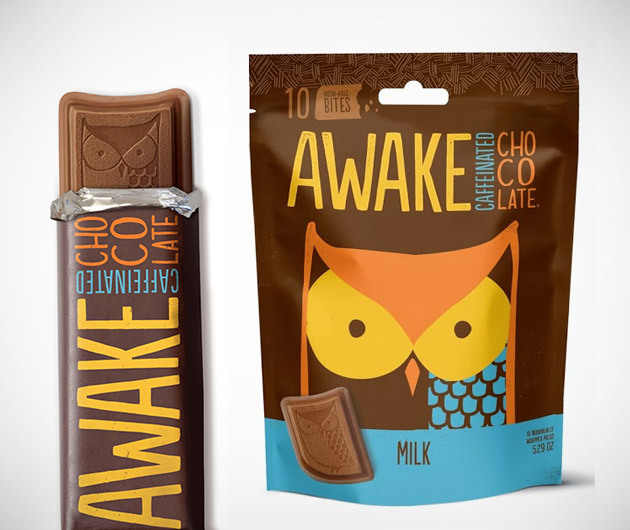 Don’t feel like eating chocolate (not just any chocolate but a bar of Awake chocolate) in the morning either? Then whip up a batch of these Wired Waffles and you’ll perk right up. They look and taste like regular waffles, except they’re called “wired” for a reason: aside from the usual waffle goodness, each 2.5-oz serving is loaded with 200mg of caffeine! 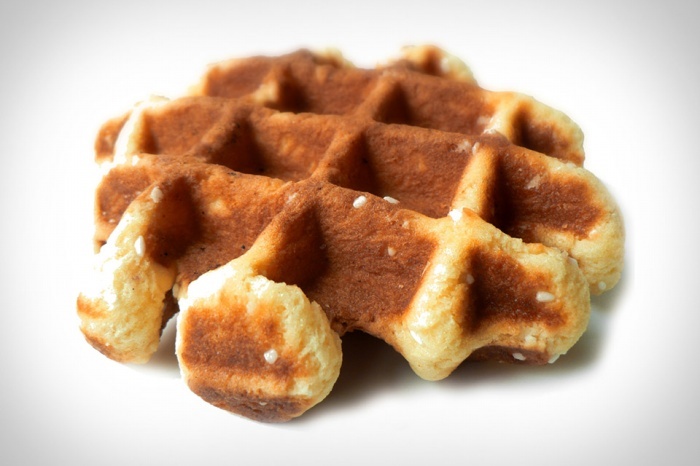 Wired Waffles come in four delicious flavors: Sugar, Cinnamon, Chocolate, and Bacon Maple. They’re available online in packs of four for $12 and packs of 12 for $30. Everyone loves a good cup o’ Joe in the morning, but sometimes you gotta run. Ain’t nobody got time to be spilling hot coffee all over your hand as you run for the bus. Grab an Awake Chocolate Bar on the way out instead, and you’ll still get as much caffeine as you would have in a regular cup of coffee. They come in dark, milk or chocolate caramel flavours and are said to taste delicious. $29 for a 12 pack. By David Ponce on 05/27/13 • Leave a comment! Jacked Up Caffeinated Baking Sugar is sugar that you can cook with, which comes with a little extra morning boost. 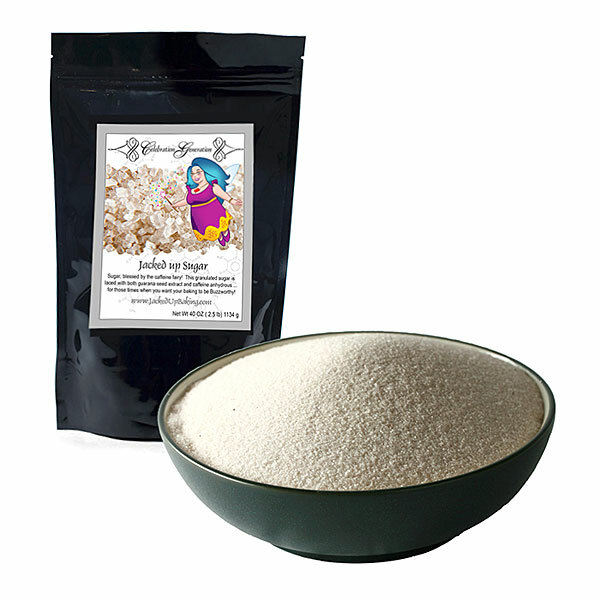 Now cookies, muffins, cakes and even pancakes can pick you up if you incorporate some of this sugar in your recipe. Of course, you probably already had that figured out from its name, so we’re not really telling you anything. So on to the facts: 1 tsp of the stuff contains 46 mg of caffeine, while 1 Tbsp has 137 mg and one cup, 2200 mg. Now, for reference, a 16oz. coffee from Dunkin Donuts has between 143-206mg, and your Starbucks’ Venti Bold Pick Of the Day packs a whopping 415mg. You’ll want to notice that it’ll take about three table spoonfuls of Jacked Up to have as much caffeine as a Starbucks large, so you’re probably not going to want to replace all the sugar in your recipes with this stuff. Figure out just how potent you want that wedding cake to be, and replace only a portion of the required sugar with Jacked Up. A 40oz. bag will set you back all of $15. In the future, our butter will be baconated, our toast will be buttered (and baconated in the process) and our eggs will be toasted. Basically, everything will be embedded in everything else, so that you don’t have to eat anything separately. It’ll be wonderful. Or… really awful. We don’t know, we’re not futurist chefs. 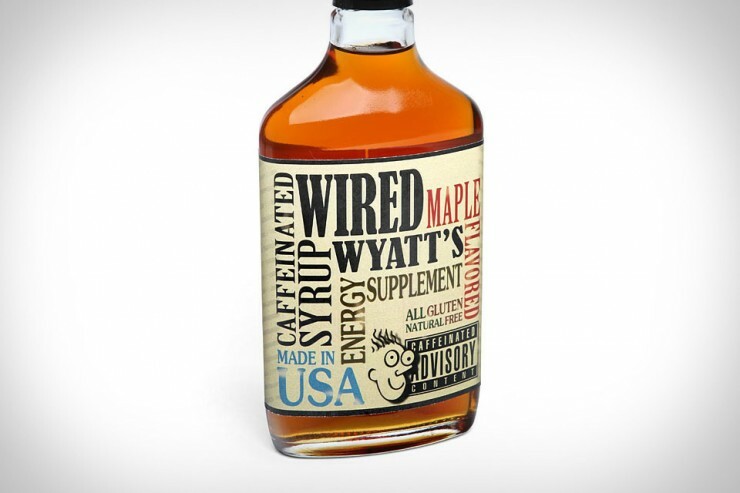 But we think Wired Wyatt’s may be onto something with their Caffeinated Maple Syrup. 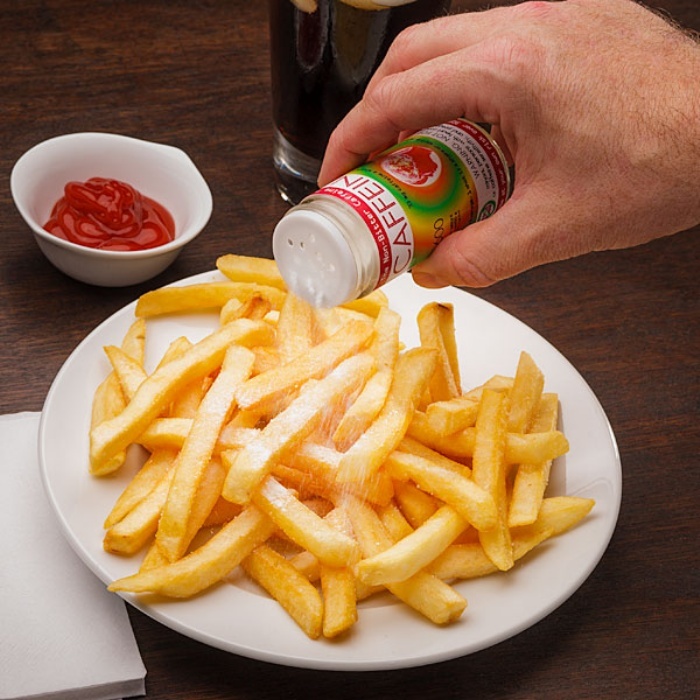 Each delicious tablespoon of sugary flavour contains 88mg of caffeine, which is about as much as one BAWLS energy drink. Two of these and you’ve got yourself a coffee’s worth. In fact, if you purchase Wired Wyatt’s other product, its Wired Waffles, you might want to keep a defibrillator nearby: those waffles contain caffeine too! A hearty breakfast might quickly turn into the shakes for the rest of the week. Do we care? Heck no, we live life on the edge, man! One waffle at a time. A bottle that contains 14 servings of the stuff is $13. Awesome, and reasonably priced.